To Enin (Berlin) uses various humming samples that I have collected from people in Berlin during my DAAD residency between 2009-2019. The hums were chopped to hundreds of smaller samples and called by Extempore based on live coding and pseudo-stocastic rules. To Enin (Berlin) was premiered at MEN festival in Wroclaw, Poland, in May 2016, as part of Sounds of Berlin. 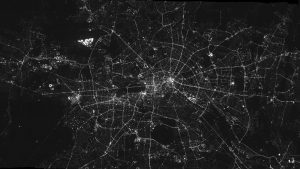 Image credit: Kuechly HU, Kyba CCM, Ruhtz T, Lindemann C, Wolter C, Fischer J, Hölker F (2012) “Aerial survey and spatial analysis of sources of light pollution in Berlin, Germany.” Remote Sensing of Environment, 126:39-50 (2012).